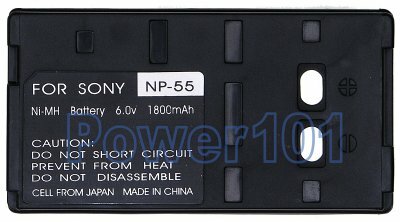 This is a standard Ni-MH battery for NP-55 and NP-77. Compatible with CCD-F30 CCD-F33 CCD-F34 CCD-F35 CCD-F36 CCD-F38 CCD-F40 CCD-F45 CCD-F46 CCD-F50 CCD-F55 CCD-F56 CCD-F70 CCD-F77 CCD-TR67 CCD-TRV22 CCD-TRV119 and more. Please check our camcorder compatibility list to verify which battery your camera needs. 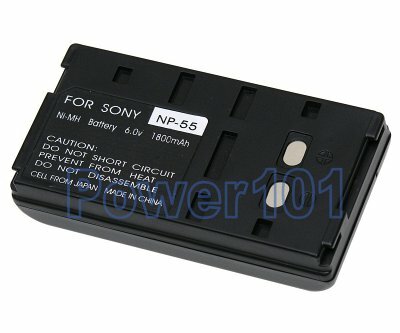 Any standard NP-55 or NP-77 charger will work with this battery. Such as the charger that comes with the camcorder. Also this battery can be charged directly on your camcorder.